WASHINGTON , D.C., UNITED STATES, March 17, 2019 /EINPresswire.com/ -- Just days after the deadly mosque shootings in Christchurch, New Zealand, over 300 individuals from various sectors of society including government officials, religious leaders, media personnel, and women and youth activists gathered on March 16 at the Embassy of Ethiopia in Washington, D.C. to write peace letters to President Donald Trump in support of the unification of North and South Korea through an international peace law. The D.C. branch of international peacebuilding organization Heavenly Culture World Peace Restoration of Light (HWPL), which hosted the event, invited participants to commemorate the third anniversary of the Declaration of Peace and Cessation of War (DPCW), an international legal framework aimed toward the cessation of war and global sustainable peace, and speak about realistic solutions toward unification of North and South Korea. Delegate Samirah’s ending remarks in regards to world peace. “More than ever we need these solutions and it all starts with us, individuals,” Samirah said. In support of He supported the peace work of HWPL stating, “Let’s continue to push for passage of the DPCW. Let’s continue to pursue peace." Participants also watched a video of HWPL Chairman Man Hee Lee give his keynote speech, which addressed the need for world peace, at the main commemoration event that was held on March 14 in Seoul, South Korea. 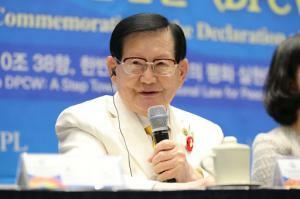 Chairman Lee, in regards to the atrocities of war and the need for unification, asked: “How can you compensate for those who lost their lives?" He concluded by encouraging attendees to participate in peace work by saying, "Instead of saying who is right and who is wrong, we have to actually work for this cause." 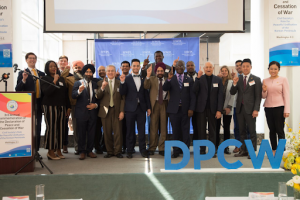 To conclude the program at the embassy, the 300 attendees wrote peace letters to President Donald Trump urging immediate action steps toward world peace and the support for the DPCW. This was aimed to call for the collaborative efforts of civil society to peace-build locally and all around the world, starting with the unification of the Korean Peninsula.